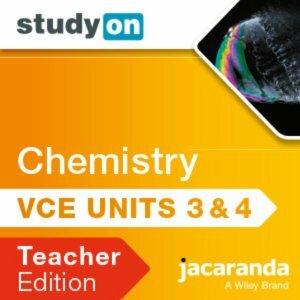 studyON VCE Chemistry Units 3 and 4 3E Teacher Edition (Online Purchase) has been updated to meet and exceed the aspirations of the 2017-2021 Study Design. StudyON is the teachers’ portal: a powerful diagnostic tool that enables teachers to track and assign activities, plus monitor student progress at an individual, group or whole class level for immediate insight. StudyOn VCE Chemistry Units 3 and 4 Teacher Edition creates new opportunities for teachers to help their students to improve their VCE exam results by implementing independent study, revision and exam practice in Year 12.